Place the chicken breasts, salsa and chicken broth in a slow cooker and leave on HIGH for 5 hours. Drain the black beans, corn, and jalapeno and mix them in a slow cooker for another hour on LOW. Be sure to adjust the amount of jalapeno to your taste. 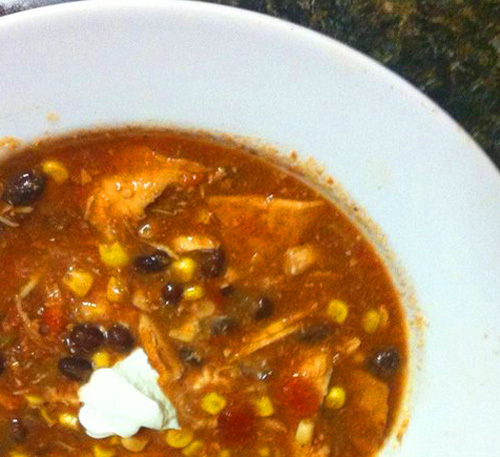 Serve soup in a bowl with a scoop of sour cream, tortilla chips, and slice of lime. This is a fantastic soup for when someone is sick, especially during cold and winter. But it's a hearty soup and can be served any time.